Physical education is just as important as any subject in an elementary school, according the Council on Physical Education for Children. Physical education helps to develop motor skills, body awareness, social interaction and cognitive development. 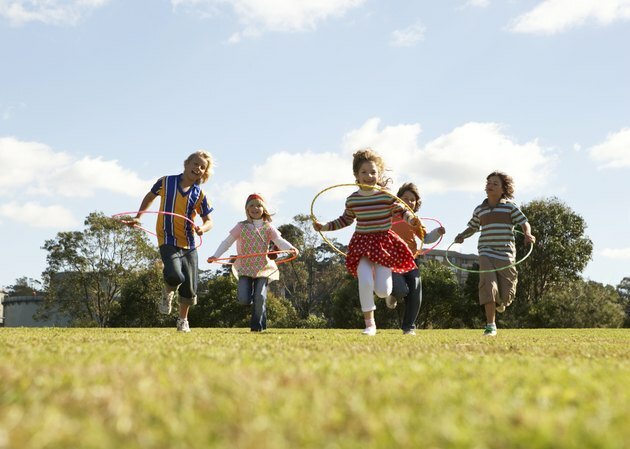 Physical education also promotes health habits that students can carry on throughout their lives. Many physical education teachers turn physical education activities into games to increase the enthusiasm of elementary school children. Balloon blitz is an appropriate game for students of all ages in an elementary school. This game helps to improve the coordination of children as well as enforcing the importance of teamwork. This exercise also provides vigorous activity for children. Physical education teachers will need a foam noodle for each student as well as about 50 balloons. Cones can be used to set up a playing field and goals or trash cans should be placed at the edge of the playing field. The class should be divided into two. Each team will need a goalie to defend its "goal" or trash can. The objective of the game is for children to hit the balloons using the noodles into the goal of the opposing team. The winning team is the team who has the most balloons in the goal at the end of the game -- when gym time is over or all the balloons are gone. Scooter soccer helps to teach teamwork, coordination as well as following directions. The class should be split into two. Each team will need a goalie. Depending on the age of elementary-school students, you can explain to them offensive and defensive positions. Children will use scooters to maneuver around the gym. Children are only allowed to use their feet to kick the ball around the gym and attempt to score a goal. This game teaches good sportsmanship as well as helping to improve the motor skills of elementary children. Physical education teachers should gather items that can be thrown but will not cause injuries. Foam balls or paper wads are acceptable items. Children should be divided into two teams and given the exact same number of items to throw. The gym should be divided so that each team is not allowed to cross a particular line going across the center of the gym. At the sound of a whistle, teams can grab the "garbage" and throw it to the other team's side. When the whistle blows again, the team with the least amount of garbage of their sides are the winners. For older children, you can make the game more interesting. The losing team may have to pick up the "garbage" or complete a certain number of pushups or sit-ups. Spin-and-run is a simple race game that provides entertainment and helps to improve coordination in elementary children. Spin students around in circles 10 times. Have them try to run across the gym. Time each student. The student with the quickest time is the winner.